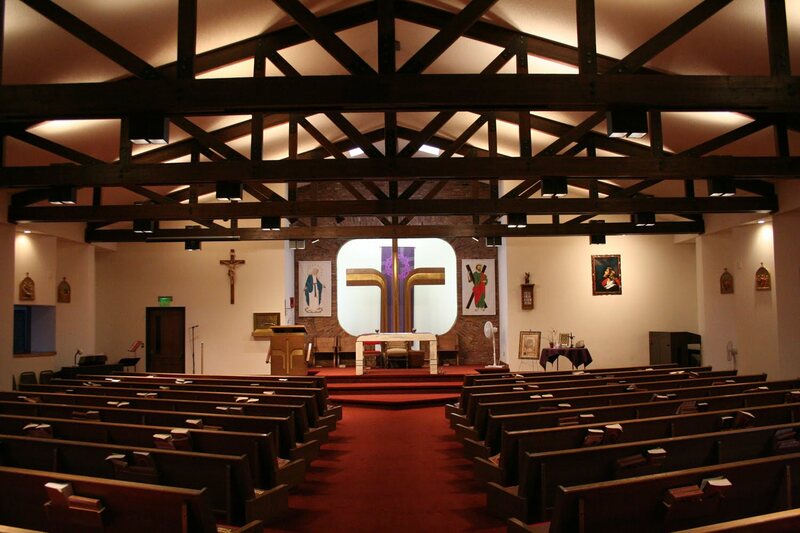 The earliest Catholic settlers of Bloomfield, Nebraska originally traveled over 35 miles to attend Mass at St. Helena. 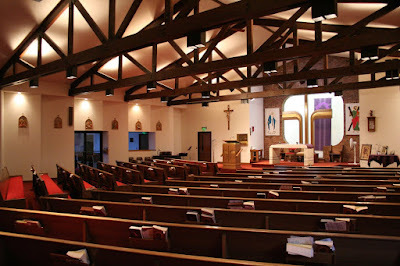 By 1895, local Catholics built a small frame church, which was replaced in 1903 by a larger frame structure. A parochial school was constructed in 1910 and closed in 1977. 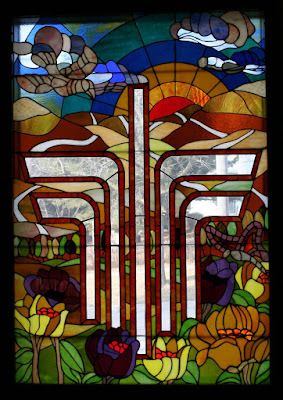 The cornerstone of the present church was laid in 1979 and the building constructed on the site of the former school. 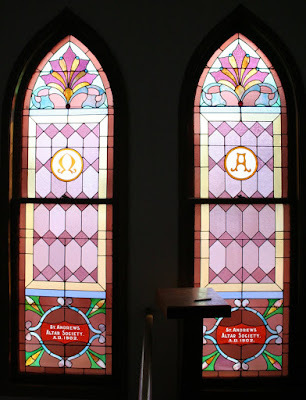 A more complete history of St. Andrew's Parish is available here. The architectural style of the church building seems to be broadly influenced by earlier Prairie School designs - of particular note are the church's stucco exterior highlighted by horizontal lines with broad overhanging eaves and interior wood trusses. 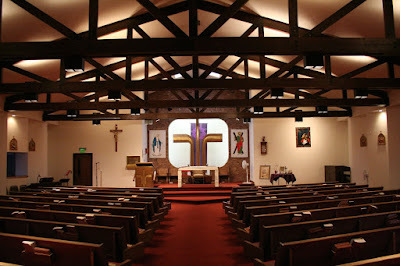 The interior of the church is simple and largely defined by its stout wooden trusses. 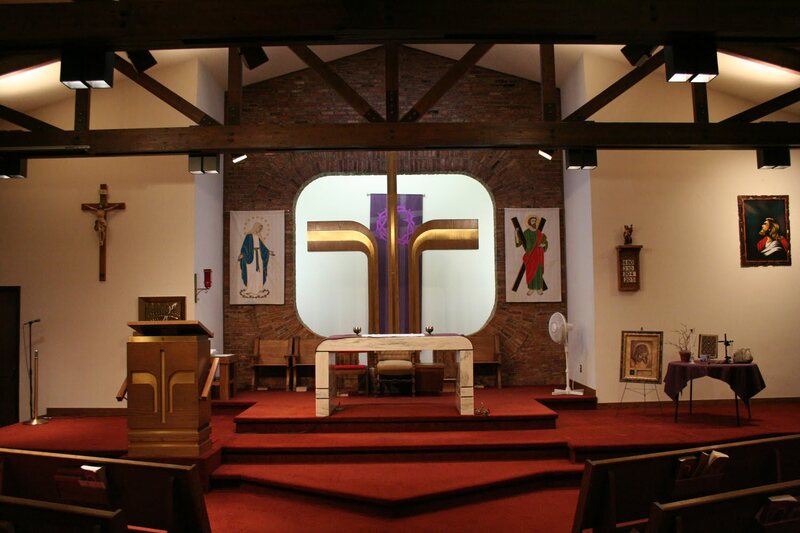 There are very few windows in the worship space and most of lighting is provided by artificial means. However, the light fixtures are cleverly incorporated into the ceiling trusses making them quite unobtrusive. A side view of the interior shows the staggered arrangement of the side walls. 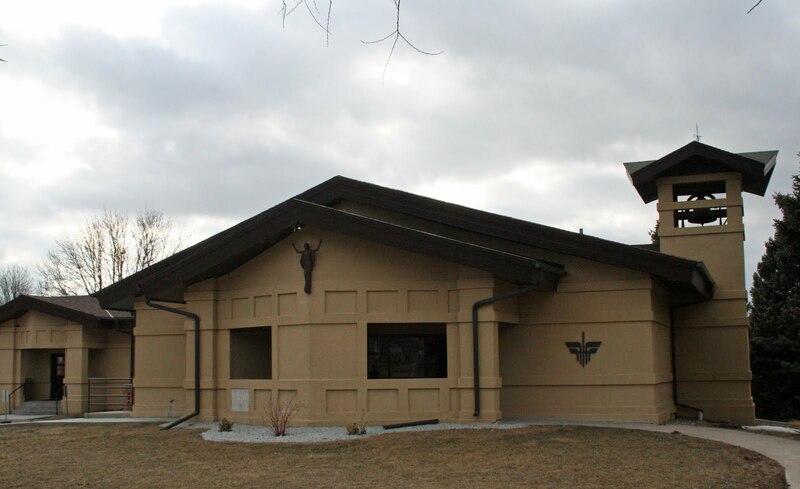 The parish's education center is through the windows to the left. 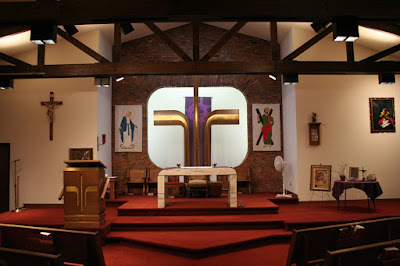 The brick wall behind the altar is constructed of bricks salvaged from the now-demolished 1910 parish school building. A simple and elegant marble altar serves as the centerpiece of the sanctuary. 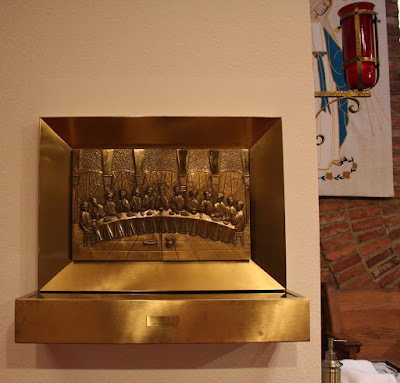 The tabernacle features a stylized image of the Last Supper. 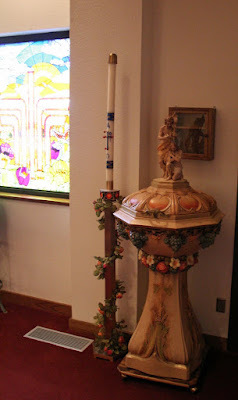 The baptismal font, ambry, and paschal candle located in a rear corner of the church. 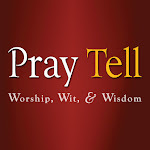 I assume that the font is from the previous church building. One of two identical stained glass windows in the rear of the nave. The motif in this window is repeated in a number of places throughout the church and its furnishings. I have not found an explanation of this symbol, however, I think that it may be a contemporary interpretation of the St. Andrew's Cross. Any reader insights? 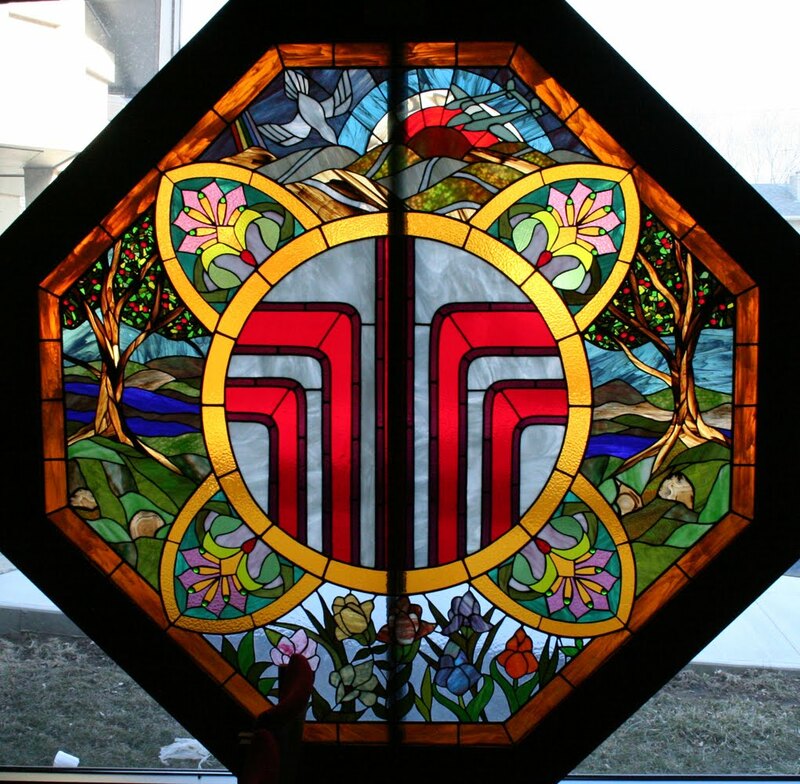 A stained glass window in the parish's education center incorporates motifs from the current and former church buildings as well as images of the local landscape. Two stained glass windows from the parish's 1903 church reside in the religious education and administration area of the building. You're insight is remarkable. As the original design Architect for the church in 1978-79 I can attest that your commentary is spot-on. Larry Chilese Architect.